At the beginning of 2016, the National Council of Nonprofits published 2015-2016: The Years in (P)Review, highlighting a dozen public policy challenges, opportunities, and emerging issues that affect the work of charitable nonprofits. The purpose then was to alert nonprofits to the existing policy trends that could positively or negatively affect their ability to advance their missions and to provide tools for engaging in advocacy activities. That was in January when legislatures were just convening and the elections were a distant concern. The results of a tumultuous year are now in and can be found in this newly published Nonprofit Policy Results of 2016. Not to spoil the gripping read (it truly is, honest), but challenges to property tax exemptions led the assault on nonprofit resources with threats arising from courts, tax assessors, and legislators in multiple states. Nonprofits encountered – and rallied to defeat – serious efforts to intrude on their independence in California (a mandatory "warning label" on fundraising messages), Oklahoma (restrictions on advocacy rights and fundraising), and elsewhere on matters which could have had broader consequences for the nonprofit community across the country. On the positive side, nonprofits and philanthropy weighed in on the need for state and local governments to implement nonprofit-friendly grants reforms from the federal Office of Management and Budget (Uniform Guidance) and some truly silly bills went down to ignominious defeat. Read Nonprofit Policy Results of 2016 and see how the issues you care about fared in legislatures across the country this year. Overtime Final Rule Further Delayed -- Now What? The Labor Department’s Overtime Final Rule is unlikely to go into effect before the new Congress convenes on January 3 and the new President is inaugurated on January 20, due to the briefing schedule announced by the Fifth Circuit Court of Appeals in a lawsuit brought by 21 states and others. Shortly before Thanksgiving a federal district judge in Texas surprised proponents and opponents of the new rule by issuing a nationwide preliminary injunction blocking the rule from taking effect as scheduled on December 1. (See the November 23 Special Edition of Nonprofit Knowledge Matters for details.) The federal government appealed to the Fifth Circuit Court of Appeals, which last week set a schedule for the last set of briefs to be filed on January 31, 2017, with oral arguments and a decision sometime later. That timing will give the 115th Congress and the new Administration opportunities to activate several options for blocking or altering the rule before it ever goes into effect. The pressing question for law-abiding, values-based nonprofit employers is what they should do now that they have made plans or actual adjustments in anticipation of the new overtime rule. Do they go ahead and implement the non-required changes; unravel job descriptions and revoke pay raises made to comply with a rule that's been blocked; tell employees to stand pat while we all wait for the courts, Congress, and the new Administration to work things out? Or was it all just a colossal waste of time? There is no one-size-fits-all answer. Read on for guiding principles that might help. Before leaving town perhaps for the rest of the year, the House and Senate of the 114th Congress passed a short-term Continuing Resolution (CR) that averts a government shutdown and provides essentially status quo funding for the federal government through April 28, 2017. That end date was set to allow the incoming Trump Administration the opportunity to weigh in on spending priorities, while also giving time to the Senate to confirm cabinet secretaries and other high-ranking federal officials. The temporary bill delays debates over whether to increase money for defense programs at the expense of domestic programs that are typically performed by nonprofits on behalf of governments. Targeting Education Endowments: Colleges and universities with endowments larger than $1 billion would be required to use at least 25 percent of their annual investment income for reducing costs of attendance for certain low-income students, if legislation announced last week is enacted in the next Congress. Among other things, the forthcoming Reducing Excessive Debt and Unfair Costs of Education (REDUCE) Act would impose a 30 percent tax on schools that do not comply, with the possibility of a 100 percent tax for continuing violations. The measure will be introduced next year by Representative Tom Reed (R-NY), who is a member of the House Ways & Means Committee and is Vice Chair of President-elect Donald Trump's transition team. Faith-Based Retirement Plans Under Review: The U.S. Supreme Court has agreed to hear an appeal regarding three nonprofit hospital systems and their employee pension plans. At issue is whether the exemption for “church plans” under the Employee Retirement Income Security Act (ERISA) extends to retirement plans created not by a religious institution itself, but to defined benefit plans created by subsidiary organizations. Lower courts have split on the issue. If the Court rules that ERISA’s strict funding rules apply, many faith-based organizations may become liable for catch-up contributions and be required to pay premiums to the Pension Benefit Guaranty Corporation. States continue reporting budget troubles in the current and next fiscal year as they assess spending obligations in advance of legislative sessions, many of which start in January. Revenue growth in the states slowed considerably in Fiscal Year 2016 as states saw weaker collections from sales, personal income, and corporate income taxes, according to a new report from the National Association of State Budget Officers. As a result, state budget officers are predicting a slowdown in state spending in the coming year. Many states are already taking action. Governors in West Virginia and Wisconsin are ordering budget cuts to address immediate shortfalls. Mississippi’s Legislature will soon be considering eliminating 1,999 unfilled state government positions and removing most agencies from civil service protection to allow agency directors to reduce staff and positions. In Oregon, the Governor is proposing spending cuts and new taxes to close a $1.7 billion budget shortfall. Likewise, the Governor of Nebraska has announced that he will be proposing an austere biennial budget for 2017-2019 that includes spending cuts due to anticipated sharp declines in state revenue and a projected deficit of nearly $1 billion. A surge of fixed costs, namely debt payments and public pension obligations, are at the center of an estimated $1.3 billion shortfall in Connecticut, leading Gian-Carl Casa of the CT Community Nonprofit Alliance to urge legislators to use caution in the cuts they make to human services, noting that “You can’t get philanthropy to fill that hole.” Kansas and Pennsylvania have both just received bad revenue results for November. Louisiana’s midyear budget deficit came in at $313 million, which is likely to require more spending cuts than originally expected. In Arkansas, the Governor reportedly is planning to cut $105 million from the state budget in the next fiscal year and shift funds from public television to public libraries, a change that could affect the work of numerous nonprofits. If the following collection of legislative proposals is any indication, the 2017 legislative sessions in the states are going to be very active for nonprofit advocates, whether fighting off bad proposals (usually the primary task of most advocates, whether in the for-profit, government, or nonprofit sectors) or promoting sound, mission-advancing public policies. Paid Leave: Maryland’s Governor announced plans last week to propose legislation requiring employers with 50 or more workers to offer paid sick leave of at least 40 hours each year. The proposal also calls for tax incentives for smaller employers to adopt paid leave benefits. This year, New York and Vermont enacted paid leave laws and voters in Arizona approved a ballot measure mandating paid sick leave and raising the state minimum wage. Giving Incentives A pre-filed bill in Arkansas would exempt from the sales and use tax donations of business wares made to charitable nonprofits, public education institutions, churches, or individuals suffering damage or loss from a natural disaster. Contracting Reforms: Maine human service nonprofits will be pushing legislation to increase reimbursement rates from the state, with the desired results that waiting lists will shorten for adults with intellectual disabilities. The nonprofits make the case that adjusting the amounts paid to reflect inflation will reduce staff turnover and encourage hiring of qualified employees, all of which directly benefit the people the nonprofits serve on behalf of the government. The settlement by Princeton University of a lawsuit may have ended one challenge to the nonprofit property tax exemption by individual residents, but it did not put the issue to rest. Predictably, a copycat lawsuit has been filed, this time with individual residents challenging the tax-exempt status of a private boarding school in Lawrence, New Jersey. Legislation is in the works to remove the ability of residents to sue nonprofits challenging their exemptions. The legislation would prohibit a taxpayer from appealing an assessment or exemption that is granted to another taxpayer. The bill also prevents third-party challenges of financial agreements between tax-exempt organizations and local governments, such as negotiated fee arrangements or payments in lieu of taxes (PILOTs). The Center for Non-Profits and others are working to get the bill on the December 19 agenda of the key committee. Currently, 28 states apply hourly minimum wage rates that are higher than the federally set rate of $7.25 per hour, a rate that Congress has not adjusted since 2009. In 19 of those states, the minimum wage is going up on or before New Year’s Day 2017. Among the new rates, Missouri will see the smallest adjustment, from $7.65/hour to $7.70/hour. Massachusetts and Washington State will reach the highest statewide minimum wage rate in the country of $11.00 per hour, effective January 1. Thanks to a ballot measure passed on election day, Arizona employees will see the biggest jump in the minimum wage, from $8.05 to $10.00 per hour. Nonprofit employers in Arizona had a tough November as they struggled to adjust job descriptions and pay rates to comply with both the expected Overtime Final Rule and a voter-approved minimum wage hike. As discussed above, the U.S. Labor Department’s new overtime rule is on indefinite hold, leading nonprofits to ask whether they should reverse recent personnel decisions they made in good faith to comply with the rule. On Election Day, Arizona voters passed a ballot measure to increase the minimum wage from $8.05 to $10.00 per hour effective January 1, 2017, and to $12.00 per hour by 2020. On the same day, voters in Flagstaff, Arizona also approved an additional local ballot initiative that increases the local minimum wage to $15.00 per hour by 2021 and to maintain a minimum wage rate that is always $2.00 per hour more than the state minimum wage. Thus, on January 1, 2017, the minimum wage in Flagstaff will go up $3.95, from $8.05 now to $12.00 per hour. Particularly for nonprofits performing services under fixed grants and contracts with governments, these large, immediate, and unforeseen changes likely will bust budgets, forcing layoffs and even closures, unless there is some form of relief, whether through new funding sources or adjustments to workloads. The Alliance of Arizona Nonprofits is working to identify how nonprofits in the state are affected by the two employment policies. The state association of nonprofits sent out a short one-page survey seeking to determine if nonprofits have made or will be making changes to comply with the minimum wage increases. It also seeks to identify changes made in advance of the overtime rule that is on hold. The Alliance wants to know what those changes were and if nonprofits need any resources or assistance with implementation. It is coupling the survey with a new dedicated webpage, AZNonprofitWageChanges, to provide the current status of the rule and helpful tools for their members. The results of the survey will provide essential feedback to inform the state association’s advocacy efforts on behalf of the nonprofit community. The Alliance is already in discussions with key state government agencies about adjusting grants and contracts to reflect the new economic realities of the voter-endorsed minimum wage hike. Feedback from frontline nonprofits can and should guide public policies. Kudos to the Alliance of Arizona Nonprofits for tapping into the wisdom and experience of their members to advance the wellbeing of the nonprofit community in the Grand Canyon State. The National Council of Nonprofits published an analysis of the elections that previews how the election results could affect nonprofit workloads in the coming months/years. Please read and share The 2016 Elections: Impact on the Work of Charitable Nonprofits. - Laurie Wolf, President and CEO, Foraker Group, the state association of nonprofits in Alaska, writing in “A Way Forward,” The Foraker Group Blog, December 9, 2016. “… when you [the federal government] take the money for programs that already exist, you've got to block grant the money back to us [the states] to give us maximum flexibility where we can create our own unique programs based on our own unique demographics and unique politics. We can come up with better solutions and, again, provide services that we the people of Utah think are important for less money." - Utah Governor Gary Herbert, transcript of interview with the Salt Lake Tribune, December 2, 2016, explaining the philosophy of Republican governors. "States will need to worry about at least three kinds of effects, all of which are highly uncertain: (1) the impact of tax reform on the economy; (2) the direct impact of tax reform on state government tax bases in cases where states conform to federal tax law; and (3) indirect impacts on state tax revenue as taxpayers change their behavior in anticipation of, and in response to, federal tax reform." - State and Local Finances Face Continued Challenges, Lucy Dadayian and Donald Boyd, Nelson A. Rockefeller Institute of Government, November 30, 2016, explaining the potential impact of federal tax reform on the states. - “DOL Overtime Regulations Blocked: What Now?,” Venable law firm webinar, November 28, 2016, addressing questions from organizations that had already started complying with the now-enjoined Overtime Final Rule. The Status (and Future) of the Overtime Rule, North Carolina Center for Nonprofits, November 23, 2016, answering questions on what nonprofits need to know about the status of the Overtime Final Rule and what actions they should be considering. Payments In Lieu Of Taxes: Five Things Providers Should Know, Health Law News blog of Hall Render law firm, December 1, 2016, providing advice about dealing with demands for payments in lieu of taxes (PILOTs) that is relevant to many nonprofits regardless of subsector. NJ Nonprofits Post-Election – Looking Ahead, Moving Forward, an op-ed by Linda Czipo, president and CEO, the Center for Non-Profits in New Jersey, published in NJ Spotlight, December 8, 2016, reminding readers that nonprofits typically are the backbone of the communities they serve and have an opportunity and obligation to keep doing their good works in the aftermath of the divisive election season. 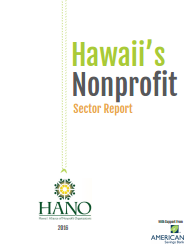 Hawaii’s Nonprofit Sector Report, Hawai`i Alliance of Nonprofit Organizations, November 2016, reporting on the array of roles of tax-exempt organizations in the state, ranging from emergency and homeless shelters to surfing clubs and hula halau. The report gives a Sector Snapshot of nonprofit empirical and financial data, a sector Perspective of challenges and the increasing demand for services, and a review of Issues & Trends of charitable giving throughout the state, with particular focus on millennials and their force for donating and volunteering. Pennsylvania’s Economy Challenges Nonprofits, Lincoln Institute for Public Opinion Research, in cooperation with the Pennsylvania Association of Nonprofit Organizations, December 7, 2016, providing the results of the 2016 Pennsylvania Charitable Organizations Survey conducted in November, including concerns about shrinking government investment in the work of nonprofits, the impact on nonprofits of the 2015-2016 budget crisis in the Commonwealth, and growing challenges to tax-exempt status. Implications of Partial Repeal of the ACA through Reconciliation, Linda Blumberg, Matthew Buettgens, and John Holahan, Urban Institute, December 6, 2016, providing estimates on the impact of repeal of the Affordable Care Act. See also Repealing Health Reform: the State-by-State Impact, Tara Straw, Center for Budget and Policy Priorities, December 8, 2016, providing state-by-state fact sheets that detail the effects of eliminating marketplace subsidies and reducing Medicaid enrollment on low- and moderate-income families, and how much each state would lose in federal funds as marketplace subsidies and the Medicaid expansion for low-income adults end.